The registration of fossil specimens of this group has allowed us to understand all the evolutionary changes that have taken place over millions of years, until the existing forms that we know in our era. 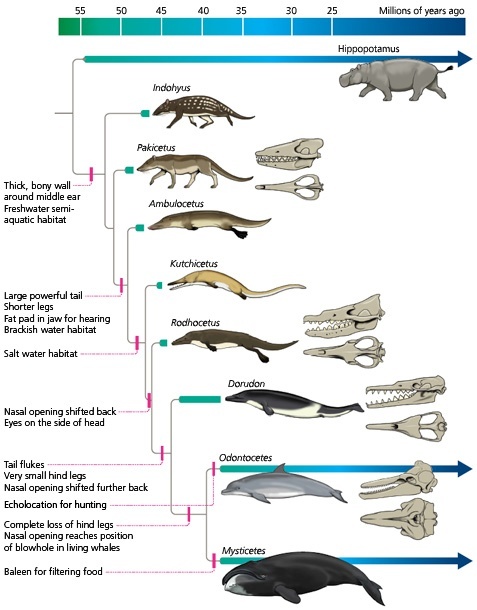 At present, there is evidence at the molecular level (DNA and proteins) that suggest that the cetaceans share a common ancestor with the Artiodactyla, animals whose weight is borne equally by the third and fourth toes walking on their “tips”, such as giraffes, camels, goats, pigs, among others. Even the experts gather these organisms and cetaceans within the Order Cetartiodactyla, in which they are closely related to hippos (Hippopotamidae family), because they share a common ancestor. While science and technology are moving ahead, and paleontologists discover more fossils, experts will be able to make clear the family ties among these animals.